Where I'll turn the ordinary into the extraordinary! well, it's really not extraordinary...it's just really cute and cheap. just sounded like a good lead-in to grab you!!! 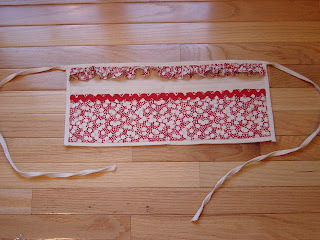 All you need to do is finish (or hem) the edges of a rectangle piece of fabric to fit the size of your apron front. I sewed ric rac to the top edge of mine. 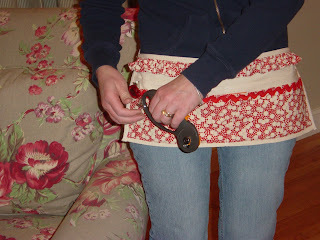 Pin the fabric to the apron and sew, through all thicknesses, along the short side, across the bottom and up the other short side...leaving the top with the ric rac open. I also sewed down the center to create 2 pockets. The fabric serves 3 purposes...1) to cover up the store name, 2) to add more pockets and 3) to make it really, really cute. I added the matching ruffle to increase the cute factor. and this is what it looks like on...sorry the picture is so dark. four pockets to hold your seam ripper (we all know the seam ripper always needs to be handy), eye glasses, pens, pencils, little post it notes to jot down a measurement...you name it. You can picture the scene...you're standing at the cutting table and there is crap everywhere (admit it, because there is) you are searching for something under fabric, patterns, books etc. Well, just keep all those things in your apron. You can move all around your sewing room and always have everything close at hand. If you want to make it really handy, just add one of these babies. I found this package at Walmart for $1.88 for four. 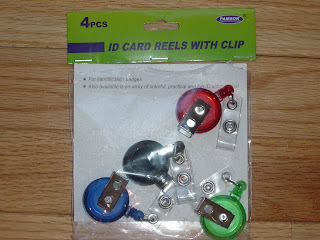 They are the clips that hold a name badge, but the have a retractable cord in them. 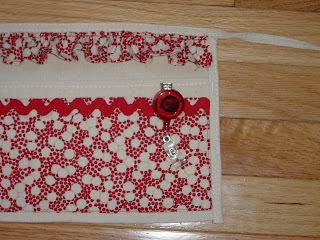 Here's the little red one, to match the apron of course! Here's an action shot of me hooking on my rotary cutter to the clip. Store it in one of the pockets when you're not using it. Don't forget to close the blade though!! When you're ready for rotary cutting action, just pull the cord out and you're ready to go. You can also attach little scissors. My retractable cord glides out very easily and at a long length. If you don't feel comfortable with your rotary cutter on a cord, it's still great just to store it in one of the pockets so you're not constantly looking under a pile of fabric for it. I hope you enjoyed this third edition of TTT. I really do love coming up with crazy things to make everyone's life a little easier and a little cuter. That is so cute! I just love the idea!! I am always looking for my things while i work! great idea, Karen -- but why do i have the feeling you've been watching me sewing?? Very cute apron! In fact, I always wear an apron when I am at my long arm. I usually have scissor, seam ripper and chalk in it. The little retractable cord thingy, I also used to use and had my scissors on it. It was very handy. Now this all makes sense. I can identify with the crap everywhere statement! I will have to put this apron together! Again, thanks for the inspiration. Super cute,Karen.Ruffle and this small rectangle shape is cute. Super cool idea, Karen! 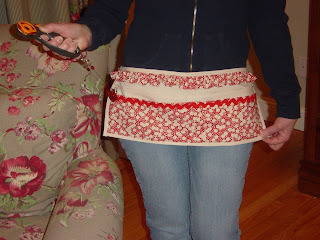 And maybe for those of us who can't get used to the idea of wearing aprons like our Mom's did, we could tack it to the edge of our sewing tables right beside where we sew. This would allow it to hang down and still allow us to put our "can't live withouts while we're sewing" stuff inside and at close proximity. I love it! Another super episode from TTT! P.S. When I saw the pretty apron on you I got a flash of a pretty French maid in a short skirt with a feather duster in her hand. All that was missing was fish net stockings. LOL! So cute. I especially enjoyed the modeling photos! If my mother sees it, she'll want one for all the Bingo workers. For each season and holiday! okay now THAT is cute! sorry i've been stuck in my little corner for so long that i didn't come over here to check everything out! i love your TTT's! Awesome idea!! I'm going to do it. thanks. Can't wait til next Tuesday. 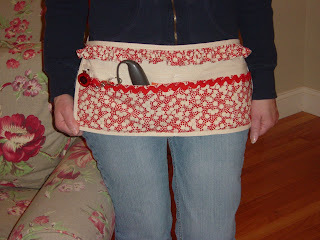 That apron is so cute...and functional...and I didn't even know they made those retractable cord clips! Thanks again for all of the great ideas! That is just too cute. I really enjoy your tool time Tuesdays. I think Home Depot should put you on the payroll. Wonder if they seen a recent increase of women shoppers in their stores!! You are just such a clever lady!! You know, I was in Home Depot last night and actually thought about you - seriously! I was looking at all sorts of things in a different light!! I just found your blog and LOVE your Tool Time Tuesday posts! I can't imagine how happy my husband will be when I tell him that we need to make a trip to Home Depot! 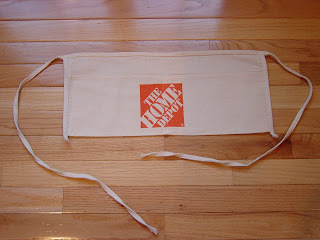 That is so cute, I think they need to sell your apron at Home Depot! Brilliant! What more can I say? What a cute and practical little apron. Great job!! 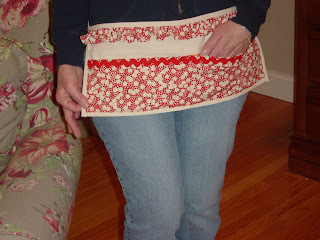 I love this cute apron, it is such a good idea! But I won't find one like that around here, it is a pitty. Could you tell how big it is? no stinkin' way!! that is the best idea of the day...no the week.....NO the month!! 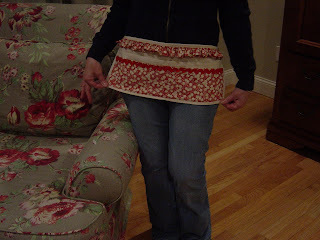 We made aprons for our quilting bees one year and this would have been CHEAPER, CUTER AND QUICKER!!! 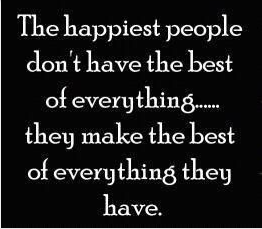 i am SO going to remember this. Thanks Karen! This is another great idea Karen...I'm always putting my cutter or scissors down and looking for them when I need them.